Democrats and unions are nursing their wounds, rightly complaining about money in politics. In the costly election — $66 million in total, with Walker outspending Tom Barrett almost 10 to 1 — a huge amount came from outside sources. Two-thirds of Walker’s money came from out-of-state corporate interests, while just over one-quarter of Barrett’s was from outside the Badger State. But Walker also received almost three times as much in the cash donations from inside the state; he would have had a huge edge even with only in-state money. But I want to back up and return to that Quaker meeting house. The people in the room weren’t the Democratic operatives that flooded the state — and who, along with Republican operatives, earned a whopping $30.4 million, according to Huffington Post researchers. They were organizers, activists and union leaders. They rightly saw that Walker’s policies could mean the death knell for many union efforts and the rollback of a host of essential services. At length, my co-trainer (and WNV columnist) George Lakey and I invited people to begin designing longer direct-action campaigns. But many in the room swung toward getting behind a unifying effort of recalling Walker. People were mostly for it right away, wooed by the straightforward logic: Take out the guy that screwed you. Makes sense, right? The problem isn’t an individual, it’s a crisis of values and priorities. Walker won because folks saw a shrinking economic pie, and they believed he was going to do the tough but necessary belt-tightening required for the state to live within its budget. 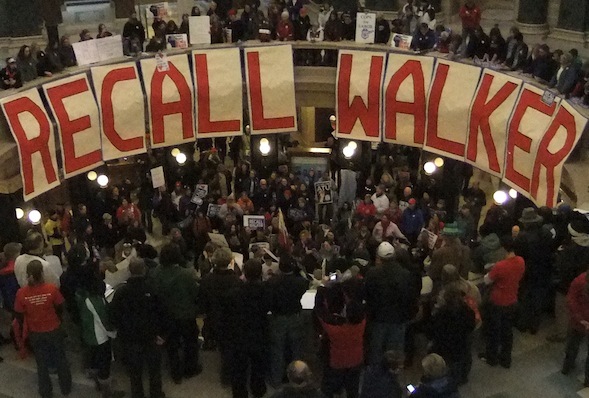 It’s a dirty secret that many union members — 37 percent — voted for Walker in the last election. His message made sense to people — or rather, the people made sense of his message. After years of growth, the U.S. economy is shrinking, and we’re running up against differing narratives about what is to blame. Elections focus our efforts and resources on very minor wins: wooing the undecided voter, scaring off the opposition’s supporters and turning out your base. For the most part, Barrett did that. He had a slight edge on undecided voters, and he maintained 94 percent support from those who had voted last year. Where he lost was turning out numbers — Walker simply got more of his base to vote, as in 2010. The results are somewhat depressing. In every poll, it was evident that many of the same people who voted for Walker voted for him again. He even maintained 37 percent support among union members. Hearts and minds had not been changed. And that’s the saddest part to me, because that’s what really needs to move. Politicians are like a balloon tied to a rock. If we swat at them, they may sway to the left or the right. But, tied down, they can only go so far. Instead of batting at them, we should move the rock: people’s activated social values. When we moved the rock, it automatically pulls all the politicians towards us — without having to pressure each one separately. Here in Pennsylvania, we were able to stop a big $560 million casino development project that had outspent us 200 to 1 — not including money they donated to city and state politicians, judges and media. We moved the population from being 80 percent supportive to mostly against because we ran campaigns based on values, instead of short-term political efficacy. To wit, our first campaign was called “Operation Transparency.” We asked for all of the casino planning documents — things like site plans, social impact studies and traffic plans — to be released by December 1 at high noon. If not, we vowed to release them ourselves through a nonviolent search and seizure operation. Our campaign built tension and drama, and it culminated in our widely-covered civil disobedience as we tried to obtain the previously hidden planning documents. Without us having to say it, it raised the question: If casinos are so great, why are they being so secretive? Show, don’t tell — that’s the way to change people’s hearts and minds. It was the strategy of the civil rights movement in the South — exposing the violence and hypocrisy so it can be seen more clearly. To do that, we have to say no to some of the short-term strategies — like a lot of electoral campaigns. Unfortunately in Wisconsin, nearly all of the energy got sucked into the recall movement, whose framing was led by Democratic operatives. I don’t know of any Wisconsin direct action campaigns — and by saying “campaign,” I’m excluding one-time actions or routine vigils and marches — that tried to reframe the debate. And that’s a major problem. As our Pennsylvania governor acts like a fool, it’s going to be tempting to pour resources into the next electoral campaign against him. But if we keep doing that, we’re going to cycle ourselves year-in and year-out into the small wins of the electoral world. We might win elections, but we’ll keep losing hearts and minds. Instead, we’ve got to look onto a big horizon and take to long-term, direct-action campaigning. Daniel Hunter is a trainer and organizer with Training for Change, and has trained thousands of activists including ethnic minorities in Burma, pastors in Sierra Leone, independence activists in northeast India, environmentalists in Australia, and Indonesian religious leaders. Eric VVilkinson: a large portion of the population wants to non-violently reduce government spending. When did wnv start towing the progressive party line with articles like this? Jesse Bacon: Eric, what poll data or research do you have that suggests voters want to reduce specific spending or give a hoot about the deficit as opposed to other priorities, like the economy? I think it’s true what Eric says, that restraining government spending is a topic of considerable public interest in the United States (though, in my opinion, people are far too eager to cut spending on public services and not nearly willing enough to slash the bloated military budget). The Tea Party is an example of a movement — in some cases even a direct-action movement — that fought on behalf of this concern. Hunter’s article does seem to assume that its readership has a certain set of political priorities and not others, yet I still think that its approach is primarily strategic, not ideological. Furthermore, it is anything but a defense of “the progressive party line.” By calling for less attention to electoral races and more attention to long-term direct-action campaigns, my sense is that Hunter is calling for a kind of politics that transcends any existing party altogether and that better reflects the needs and concerns of ordinary people. The Walker recall was only about one thing: unions want to continue to be able to FORCE people to pay union dues and thus have “representation” and people clearly don’t want to pay those dues. Union membership plummeted once the FORCED dues payments were removed. This isn’t about some high-minded b.s. “labor versus the Man” crap. It’s about whether or not someone should be forced to pay a portion of their salary to a union in order to hold a job. Period. That really seems like a severe simplification. It makes it hard to understand why, when the unions were threatened last spring, the state capitol became flooded with union members in protest. Why should we accept or promote that there is or should be a binary opposition? I think line this reflects the ideological bias of the people who promote it, rather than any objective evidence. In Mexico, right now, a clever protest movement is having great success taking the opposite approach: complementing electoral activism, rather than attacking it. People who don’t want to knock on doors or make phone calls should figure out how to do other things that complement those efforts and address their shortfalls. That’s what the protest movement in Mexico is doing. I think this is a great point — direct action and electoral work should not be mutually exclusive! That’s right. And I think Mexico could be a useful model of direct action around an electoral issue (noting, for instance, that according to Marta Molina’s reporting for WNV, the movement itself has stressed that it is non-partisan). What if a comparable movement existed in the US calling on candidates of both parties not to accept corporate contributions? But I think Hunter is making a somewhat more modest claim here. He’s not calling on activists to ignore elections completely, or to work for the end of an electoral system. Rather, he’s warning activists not to put their eggs so much in that basket. The overwhelming tendency in our system, given that there’s a reasonably transparent process and a history of republicanism, is to put all our political hopes in elections. In turn, candidates and electoral machines resist direct action tactics because they introduce elements that can threaten their operations (that is, their powerful donors who are intent on maintaining the status quo). I think Hunter is saying that, in this case, if you’re going to defeat the 1 percent, the electoral field may not be your strongest suit. Don’t forget about it, but don’t assume that salvation will lie there alone — as many in Wisconsin seem to have done. What’s Going down i am new to this, I stumbled upon this I have discovered It positively useful and it has aided me out loads. I hope to give a contribution & aid other customers like its aided me. Good job.